Fifteen minutes into the first lecture, Mr. Levoy talks about one of the most important aspects of art- perspective. He talks about perspective in a scientific way. When you capture an image of a real object on a plane, be it as a painting, one of the earliest forms, or photography, which came much later, there are two important ways to look at it. One was the natural perspective that Euclid explained in his book on Optics. The natural perspective discusses the distance between the eye and the object, and the angle the object subtends to the eye. In simple terms, the natural perspective tells you that farther objects subtend smaller angles. The other type is the linear perspective theory created by Filippo Brunelleschi. This basically tells you that closer objects are projected larger on a picture plane. 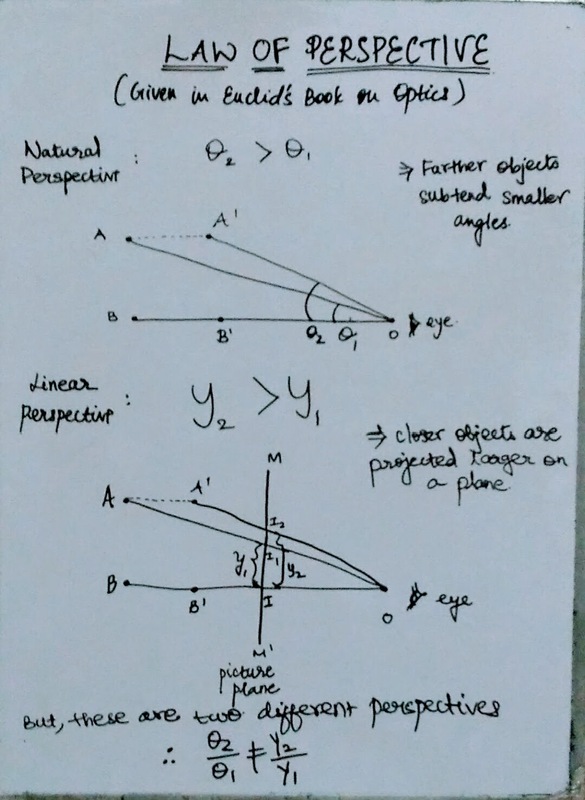 Using this simple mathematics as derived from the linear perspective theory, the approximate size of the projection on the plane as compared to the actual size of the object can be determined. In the above picture: y is the height of the projection; h is the height of the object; x is the distance of object from the eye; and z is the distance of the picture plane from the eye. This was of key importance in the paintings during the Renaissance as the painters attempted to produce or showcase depth on a plane sheet. It was generally concluded from the linear perspective theory that all objects away from the painter must converge at a farther point. So, how is this theory of perspective related to photography? Well, for photographers to choose an optimum focal length for the right aperture that would capture the scene, the way they envision, it is necessary that they have a general sense of perspective. It is not required, and is not possible, to do mathematics every time. But it is necessary to rather have a ‘feel’ of the right perspective that they need for a particular shot. There is a tamil saying that translates into “Your hand doesn’t measure what your eye doesn’t”, which sums up the the topic of discussion here: perspective.